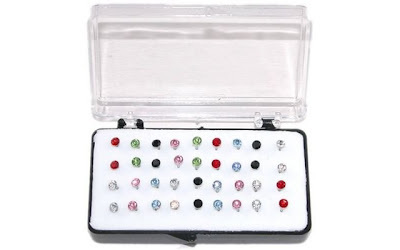 This Set of 18 Pairs 1/8" Crystal Stud Earrings on Nylon Posts is currently selling for just $11.99 on Amazon.com! You will be saving 66% off the listed price of $35.00 with this jewelry deal. What I like about this earring set is that there are duplicate colors, which makes it perfect for the girl who loses her earrings often. These earrings also come in a ready-to-wrap box!